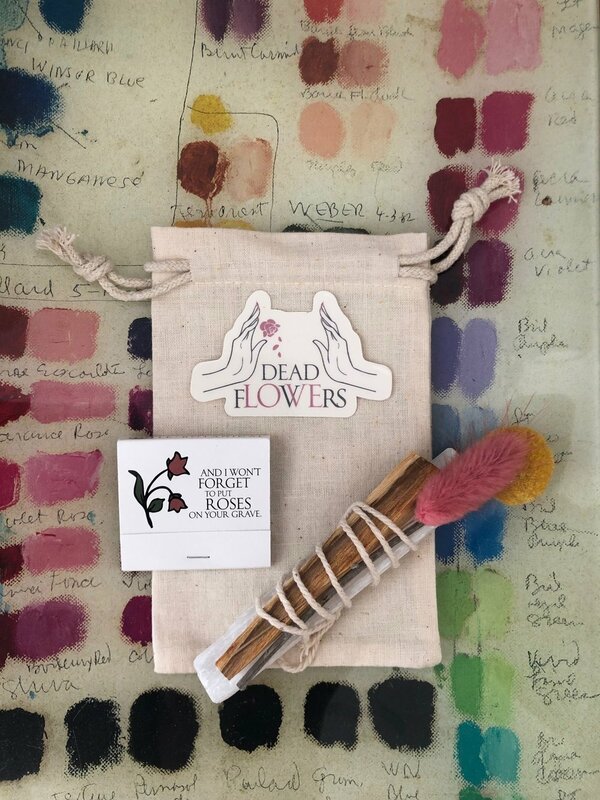 The Goddess kit comes in an organic muslin pouch and includes ethically sourced Palo Santo from Peru, a Selenite wand, a Fleurs Mortes micro arrangement, a Dead Flowers sticker and match book. Selenite is a powerful form of gypsum crystal and is named after the Greek goddess of the moon, Selene. It’s mystic and metaphysical properties include stabilizing and balancing the emotional body, removing energy blockages and protection from negative energy. Palo Santo is traditionally used for relieving common colds, flu symptoms, stress, headaches, anxiety, depression and emotional pain. The Fleurs Mortes micro arrangement is dried, therefore will last forever! Do not burn this, but set in a small vase or lay over tarot cards as a botanical offering.